In many ways, raising investment is a confidence game. Not only will investors want to get to know the founding team and the business plan so that they have confidence in your abilities, but investors will look for external validation too. They may hold back on committing to investing until they see that someone else believes in the idea sufficiently to invest in it. Once you have your first investor – or your cornerstone investment – it becomes easier to raise the remainder of the investment. But how do you find your first investor? It can feel like a catch 22 situation! Hatty Fawcett of Focused For Business asked four founders who have recently raised – or are in the process of raising – investment how they went about it. Where did you find your investors? It can be a daunting task, wondering where you will find investors but these founders were full of practical suggestions. How do you opening the conversation with investors? Personal connections are useful not just in finding investors but in actually opening the conversation with them too. All the founders I interviewed had found key investors as a result of an introduction – Shon and Ian both found Chairman that way too. Kevin stresses the importance of the phone in making first contact with investors, and he advises against relying on email. There is no doubt that the constant conversations with investors can feel like hardwork. You will need self-belief, persistence and energy. What Kevin found hardest was understanding exactly what investors were looking for. He started by stressing how quickly the business could scale but it turned out investors were more interested in what the business had already achieved. Getting the story right and stressing the facts of what had been achieved to date was the key to overcoming investors’ barriers. Each of the founders I interviewed had an interesting – and sometimes surprising – piece of advice to offer for winning investors. 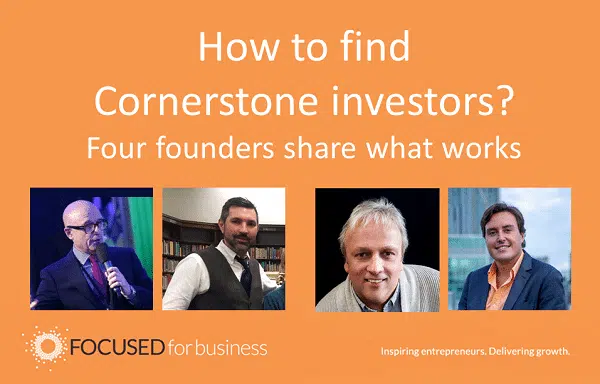 Finding your cornerstone investment – or your lead investor – takes hard work and persistence but making sure you are “investor ready”, reaching out to all your contacts and making personal requests are three key steps that deliver results. Good luck!